View product videos and webinars below. 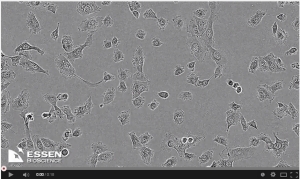 See NucView® 488 Caspase-3 Enzyme Substrate in action in this video provided by Essen Bioscience using their IncuCyte® ZOOM live cell imaging system. Cells from the HT-1080 human fibroscarcoma-derived cell line were treated with 150 nM camptothecin in the presence of 5 uM NucView® 488 Caspase-3 Substrate. The cells were imaged every 30 minutes for 24 hours, during which apoptosis can be observed by changes in cellular morphology and green fluorescence that is emitted upon DNA binding from the DNA binding NucView® 488 free dye released by the activity of caspase-3 upon the substrate. Incucyte is a registered trademark of Essen Bioscience. Fluorescent western blots are becoming an increasingly important technology for the detection of proteins using immunoassays. While chemiluminescence provides a high degree of sensitivity for reliable protein quantification in the lab, near-infrared (NIR) fluorescent Westerns allow researchers to rapidly probe for multiple proteins while also decreasing the time and labor required for blot development.